3 Bedroom Semi Detached House For Sale in Sheffield for £133,500. An internal inspection is imperative to appreciate the size of accommodation in this 3 bedroomed modern semi detached home. 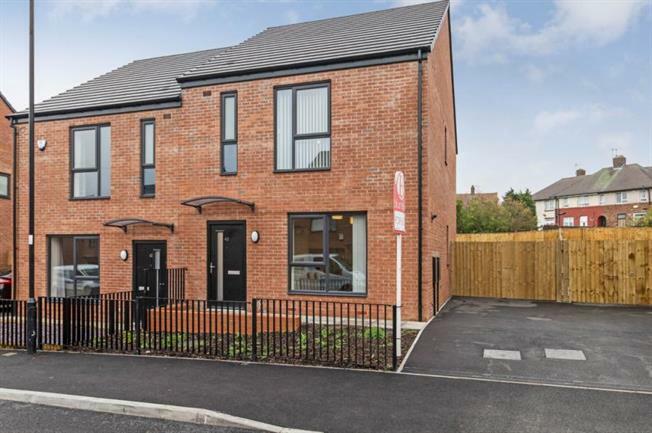 Constructed in 2018, the property is available with no chain and offers spacious accommodation over two levels with the benefit of double glazing, GCH, driveway and gated space to the rear extensive lawned garden and forecourt. the property is immaculate throughout with two bathrooms, downstairs WC and useful storage room. Ideally located in the heart of this popular and convenient suburb, with excellent amenities including local shops, supermarkets, schooling and public transport links. The accommodation comprises an entrance hallway with stairs to first floor landing, The stunning dining kitchen has an excellent range of base and wall units finished in high gloss white with contrasting work surfacing and uplift, having wood effect flooring, coming complete with integrated oven, hob and extractor. The spacious lounge is carpeted with picture window and door opening onto the patio and garden. On the first floor the Master bedroom is carpeted with door to ensuite shower room having WC, wash basin and shower enclosure. Bedroom two is carpeted and bedroom three is also carpeted. The bathroom has three piece comprising WC, wash basin and bath in white with shower over. To the exterior of the property is a forecourt to the front a drive way with gated area to the rear and to the rear a garden area with patio and lawn provide an excellent outdoor seating and entertaining area.